1. Fantasmic – After enjoying a long day in Disney’s Hollywood Studios and experiencing all that there is to see, there is one nighttime entertainment extravaganza that guests simply must enjoy. Fantasmic is performed nightly in the Hollywood Hills Amphitheater located on Sunset Boulevard. After entering through the show’s main gate, guests walk a short distance to the large theater behind The Twilight Zone Tower of Terror and settle in for an unforgettable experience. 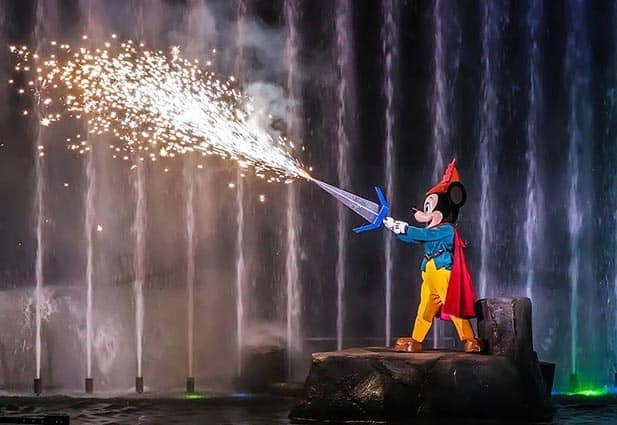 Fantasmic combines special effects, favorite characters, classic music, projected animation, dancing water, pyrotechnics, fireworks, and more to bring an immersive experience to life. The show is centered around Mickey’s imagination coming to life and creating an epic battle between himself and good forces versus evil and Disney villains. While each moment of Fantasmicis incredible, guests are sure to especially love when Mickey faces off with Maleficent in massive dragon form. Fantasmic is an amazing show to enjoy and the perfect way to end any day spent in Disney’s Hollywood Studios.